Andrew Cartmel is probably best known for being script editor for the Sylvester McCoy era of Doctor Who but he has also written a number of novels. I enjoyed his two Rupert Hood spy novels – Operation Herod and Event Driven - but this latest novel is the first in what is intended to be a series. It is the tale of an unnamed record collector who once handed out business cards calling himself ‘Vinyl Detective’. It’s an affectation but it is one that leads to him getting involved in the quest for an extremely rare LP. Of course being a detective story it can’t possibly be that simple. There are twists and turns. There are cats, charity shops and coffee. There are femmes both fatale and not so fatale. Our nameless hero is, of course, the sort of man that can – eventually – charm women into bed even if it turns out to be as much of a surprise to him as it is to us. The story begins and ends in London but there’s international travel. It’s like James Bond with carrier bags. The book manages to make some of the more esoteric things about collecting rare records seem fascinating. I now know what dead wax is for example, which I never did before. Whether that information will be of use to me or not I have yet to discover. If it reminds me of anything it reminds me of Jonathan Gash’s ‘Lovejoy’ books (and the television series that followed.) Our nameless hero has some of the ‘divvie’ quality of Lovejoy. A ‘divvie’ is someone who has an uncanny knack of being able to spot the genuine amongst the fake. Our unnamed hero’s knack is less uncanny and more built on knowledge. The ability to know the difference between a Japanese re-release and an original. (I wrote that previous sentence as if means something. It almost certainly doesn’t. Pretend I picked a genuine example from the world of record collecting.) But ‘Lovejoy’ might be the easy comparison as they have the collecting of things that have value to some but not to all in common. I really enjoyed it. It’s nicely paced, well-written and packed full of interesting information. I read it from cover to cover in a day. Fortunately, a day when I had nothing else to do but read. 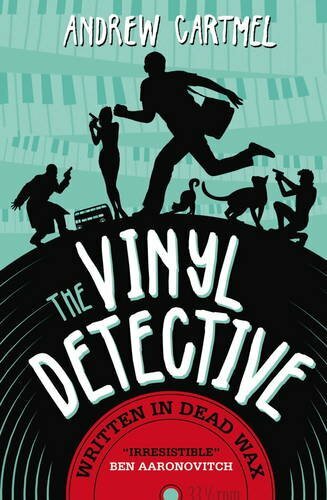 It’s also does a fine job of making you want to hear more about the incredibly adventures of our Vinyl Detective. I have a confession to make to. I only realised, as I sat down to write this review, that he doesn’t have a name. I don’t think anyone ever calls him by it unless I missed it. I wonder what Andrew Cartmel’s reason is for this. And he must have a reason because there are a couple of moments where he has to go out of his way to not mention it. Perhaps all will become clear later. Or not. Still I’d recommend you give it a read if you like detective stories without actual detectives in them. There’s a mystery here that is fun to watch ‘the man with no name’ unravel. Give it a spin.